Long ago, it is said that Giants ruled the Earth. Just as Dragons are the servants of Chaos, spreading discord and disorder wherever they go, Giants are the culmination of Law. The homeland of the Giants is eternal, and while its location may shift, it always exists. However, you cannot usually find it. You either stumble into it or follow a special type of map, prepared by another Giant. However, not all Giants live in their Homeland. In the past, Giants ruled the Earth. Under their ruthless dominion, all the little races lived in relative peace and security, though they were all equally suppressed by the Giants. But the Giant Empire inevitable collapsed, and the majority of Giants retreated to their homeland. At first, people were eager for revenge, and so attempts were made to attack and conquer the Giants. All of these attempts failed catastrophically. But when the Giant Empire collapsed, many pockets of Giants were left behind, as they were too entrenched or too isolated to notice the Empire was pulling back. Others simply insisted that their work was too important to interrupt, and they would catch up later. Some of these Giants did eventually return home, but others did not, as you can still find small groups of Giants scattered in other nation's lands. Many nations tolerate these Giants or otherwise ignore them, as Giants are very hard to dislodge once settled and very dangerous at any time. Damage Reduction: Giants take -2 damage from all Weapons not designed to kill something as big as them. Your Sword is a toothpick to them. Giant Weapon: A sword, spear, or any other weapon meant for fighting giants. Does 2d8 damage, but gets -4 to hit against something smaller than a Giant. They also do this much damage against other, similarly sized things, such as Dragons, Trolls, Giant Demons and other such things. Manning Broom: A device meant to kill smallfolk. Looks like a broom, but replace with bristles with barbed wire, and occasionally there are big spikes poking out of it. Does 1d8 damage on a hit, and can hit everything adjacent to the target. Still requires multiple attack rolls though. Thrown Object: These are boulders, trees, smallfolk, smaller Giants, anything the Giant can get their hands on. Does 3d6 damage on a hit, save for half. If your DEX is 14 or higher, save to avoid all damage. On a failure, you still only take half damage. Additionally, there is one other thing you must know. Unlike Dragons, which are each unique and terrible in their own way, Giants are engineered and modified at and before birth to fit a specific mold. Each Giant has its destiny chosen for it before his mother and father lay together, though this process is not as dramatic as the sages say it is. Generally, unless something goes terribly wrong, two Giants of the same Caste will produce a Giant of their Caste. Also, barring bizarre circumstances, Giants cannot breed outside their Caste. Each caste is highly specialized, designed to perform one task exceedingly well. The whole society from top down is organized for the betterment of the whole, so that all Giants can depend on all other Giants. The Hill Giants are the bottom of the society, meant to be common laborers and servants to the rulers. Above them you have the Fire and Wood Giants, who fight the battles of Giantkind and feed the Giants, respectively. Then there are the Frost Giants, who fight or sleep, frozen in ice, awaiting the day they are thawed out. Legends tell that the awakening of the Sleeping Frost Giants will be one of the Seven signs of the End of the Age, and the return of the Authority. From there we have the Sun Giants and the Stone Giants, the former being philosophers, mathematicians, and wizards, the latter being plumbers, carpenters, watchmakers and artists. Then finally, at the top of the hierarchy, we have the Cloud Giants, and then the Storm Giants, and at the very tip of the hierarchy, the Storm King, the strongest Giant in all the world. Hill Giants were created to be servants and attendants to Giant Royalty. They are remarkably servile for their enormous size, and most are skilled at cooking, cleaning, and managing other servants. Hill Giants are also famous for kidnapping promising smallfolk to be their Ruler, and when the Ruler inevitably disappoints them, quietly disposing of them and then feigning ignorance. And while these partnerships rarely end well, sometimes they do, and can even last for a very long time. There are many stories of willful royal children who end up ruling a steading of Hill Giants for decades, or a Wizard who stumbles down a rabbit hole into a mead hall of Hill Giants, only to find them perfectly willing to bow to him. Of course, there are many more stories how Hill Giants are just pretending to be servile to lure you in and eat you. The truth of these stories is probably in the middle somewhere. Though Giants don't usually eat people- that is a confabulation made up by humans. Smallfolk have too little meat and too many bones to eat efficiently. If a Giant wants to get rid of you, they'll just kill you. Additionally, there is a small distinction to make. There are two kinds of Hill Giant. The first is the kind above, the Foothill Giants. These are the ones meant to serve at the feet of the nobility. The other type of Hill Giant is called the Steephill Giants, who are instead used as common laborers. The distinctions between these two Giants is largely indistinguishable in terms of appearance, and can only be seen in dress and how they conduct themselves, with Steephill Giants being much more plucky and independent than Foothill Giants. Weak Soul: Hill Giants get -4 to save against spells that influence, such as Charm Person or Fear. Additionally, any spell that might not affect a creature of their size or nature has 2-in-6 chance of working against them anyway. Prominent examples might be something such as Charm Beast, or Mass Charm Person. 1- A royal child has gone missing on a hunting trip. When you find them, they are in the company of a group of Hill Giants, who have adopted them as their new leader. The child will be fine for a while, but inevitably they will slip up and be disposed of. 2- An evil Wizard has a steading of Hill Giants under his control. Find a way to separate the Hill Giants from their master, before the Wizard uses them to do something horrible. 3- A Hill Giant has shown up at the distant castle of a frontier noble, and has inserted themselves into the household, commanding the other servants. The noble is immensely pleased by this, but other powers find this disconcerting. They want you to get rid of the Hill Giant, by any means necessary. 4- As above, but the Hill Giant is actually a scout for an upcoming Giant invasion by a prominent Cloud Giant. Besides the Hill Giant, no one knows that, but there are signs of an enemy army approaching. Many people wonder how Giants can produce enough food to feed an entire society of giant monsters, especially when many Human farmers struggle to feed their families. The answer is three-fold. First, there are a lot fewer Giants than Humans think there are. Secondly, they use magic to enhance their crops, to grow corn stalk that reach ten feet tall with ears as thick as man's arm, or tomatoes the size of baseballs. Thirdly, they have the Wood Giants. They aren't made of Wood, but they do look the part. 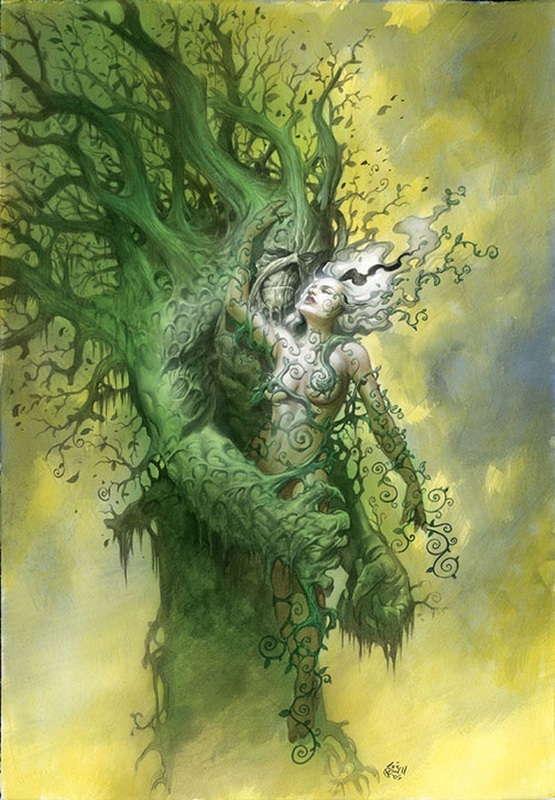 Wood Giants are green or mottle-brown skinned, often with moss growing in their hair or garlands of living flowers or crowns of creeper vines wrapped around their bodies. They are the Agriculturalists, Herbalists and Botanists of Giant-kind. They have a unique bond with domesticated Plants, and can coax even lousy soil into producing bountiful harvests, assuming the Weather cooperates, though this is never a problem in Giant Land, unless a bunch of Cloud Giants are borrowing the rain storms for some ridiculous game. 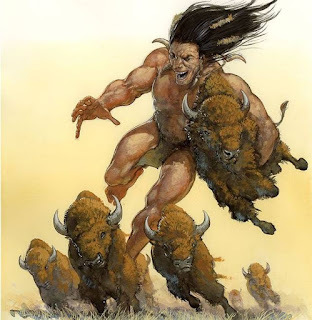 Wood Giants also supervise all other types of farming in Giant Lands, including herding domesticated animals. They also tend to any non-Giant slaves, for reasons that must have made sense at the time. When not in Giant lands, Wood Giants usually live in enormous, walled farms, producing the best produce and tastiest animal products imaginable. Sometimes these farms employ human or other smallfolk slaves, but just as often the smallfolk who assist the Wood Giants are farmhands who serve the giant and get to live off its largesse in exchange. Some of them even get paid, though usually not in money. 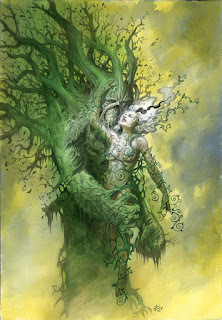 Innate Spellcasting: Wood Giants can cast the following spells as first level spells as a full action. 1- A Baron wants to know how his rival has managed to grow such large pumpkins and defeat him every year at the Largest Pumpkin Contest at the Goblinwatch Festival for the last five years in a row. As such, you are hired to investigate it. The answer is that a Wood Giant is helping the rival, of course. 2- A Wizard threatened a Wood Giant, demanding the secret to the Wood Giant's delicious grapes. The Wood Giant acquiesced, and told the Wizard his secret. But when harvest came, the grape vines instead of bearing fruit bore monsters. The Wizard's vineyard is burning, and the grape-men and jelly-boys are running rampant. Find the Wood Giant and see if he has any solution to this problem. 3- A friendly or important NPC has come down with a mysterious illness. But the only known antidote is located faraway on a Wood Giant's farm. Only a bunch of plucky heroes such as yourself could retrieve it and come back alive. 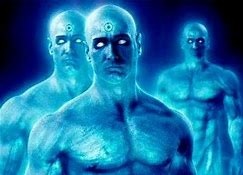 4- As above, except the NPC is not ill, and needs to be. Retrieve this rare poison from the Wood Giant's farm, and don't let him realize what you're doing. Long ago, the Forces of Hell tried to invade the surface through the Veins of the Earth. This may be why the Giant Empire spread in the first place, as people fled to the only ones who could stand against the Legions of Hell. Some ancient histories do detail how the smallfolk were helped by "Great Men who stood on Mountains". But when it came time for a Counterattack, the Giants realized that they were not suited for underground fighting. They were too large, and they could not stand the heat. So they created someone who could. 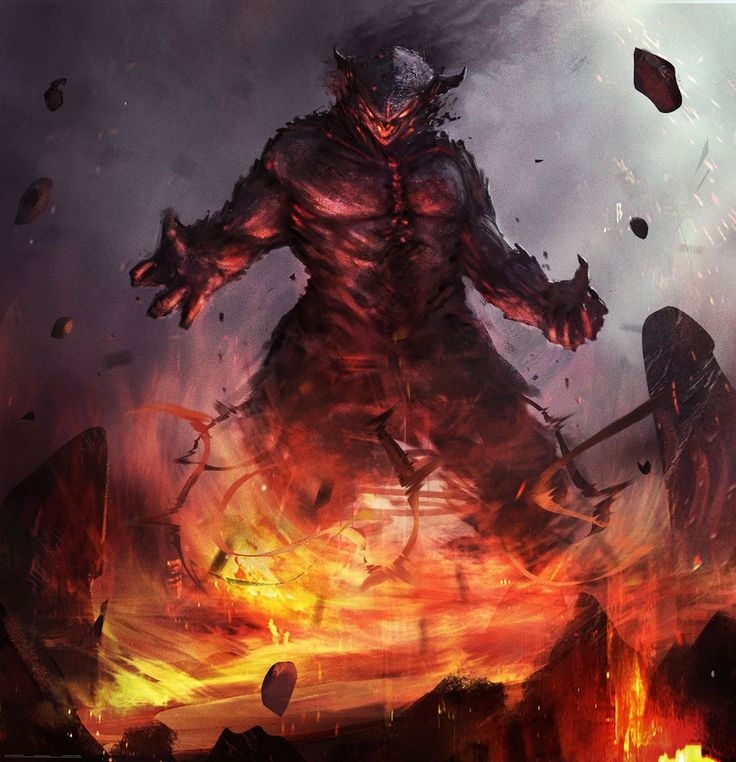 The Fire Giants were created for the sole purpose of fighting the Legions of Hell. Smaller, narrower and more compact than other Giants, they could more easily fit into the tunnels beneath the Earth, and their immunity to heat meant that the flames of Hell did not stop them for a second. It is said that deep below the Earth, there are still fortresses full of Fire Giants, excavating tunnels and fortresses, digging in and waiting for the order to withdraw. Some say they are still down there because their masters have forgotten about them. Others say it is because they are waiting for the day when the Gates of Hell once again fly open, and the War begins anew. But on the surface, Fire Giants form the rank and file of Giant armies, and usually form the bulk of the police force in any Giant polity. Others who are unbound to any Master form mercenary companies and travel through the lands of the smallfolk, charging exorbitant rates for their services. But while the cost of hiring a platoon of Giants is potentially ruinous, the penalty for not doing so can be equally so, especially when your enemy has. There is a 1-in-6 chance that any group of Fire Giants or any Fire Giants has a Giant whose instead of bones, has a skeleton made of cartilage, and can squeeze through almost any small space. 1- The War has been raging for some time now. But the side you're not on/the one you dislike has hired a band of Fire Giant mercenaries. Try and buy them out, or get them to break their contract, before they go and win the war for the other side! 2- A group of Humans in Giant territory were captured by Fire Giants. This is an act of War! But also, going to war with Giants never works. So go and free them, please, hopefully without fighting the entire garrison of Fire Giants guarding the place where the captives are being held. 3- A Giant army is marching across friendly territory. 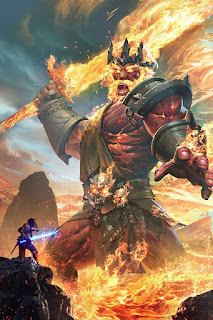 The Cloud Giant in charge promised his men would behave, but there are reports of Fire Giants rampaging around, stealing livestock and lighting things on fire. Confirm the truth of these rumors, and whether or not they are merely deserters, criminals or this is some clever ruse on behalf of the Cloud Giant. 4- A group of wounded, badly weakened Fire Giants suddenly emerge in the middle of an empty field and start running in random directions. If interrogated, the Fie Giants reveal that they are the descendants of the Fire Giants sent into the Veins to fight the Long War, against the Forces of Hell. Find out what could be terrifying enough to scatter such mighty warriors, and make sure there's no chance of it reaching the surface. But the Fire Giants were limited in their usefulness. They were too small to successfully fight larger opponents with reliable success, such as Dragons or the Great Trolls, and smallfolk could kill them far more often than was preferrable. Plus, as the Giant armies descended further into Hell, they found that many of the lower levels were not merely burning, but some were freezing cold. So the Sun Giants went back to the drawing board, and came up with an even greater monster. Frost Giants are killing machines, bred exclusively for war. They are resilient to both extreme cold and heat, and they have the ability to blast freezing gouts of air from their mouths. These gouts of air are so intense they can freeze smallfolk to death. But even if an opponent is hardier than they first estimated, the blast of cold air still robs them of their coordination and initiative. However, as useful as they were in the Battle over Hell, the Frost Giants also presented a potential liability. They are exclusively bred for war, and as the Giants with the most base physical Strength, they began to wonder why they should obey those higher on the hierarchy than them. So when they revolted, perhaps its was not a surprise, but it was a disappointment. However, as strong as they were, the superior numbers of the other Giants and the magicks of the Cloud Giants lead to their complete and utter defeat. After this defeat, the Cloud Giants banished the Frost Giants to the coldest and most inhospitable places in the world, forcing them to hunt whales and seals for food, and to tend patches of multi-colored lichen without the aid of the Wood Giants. 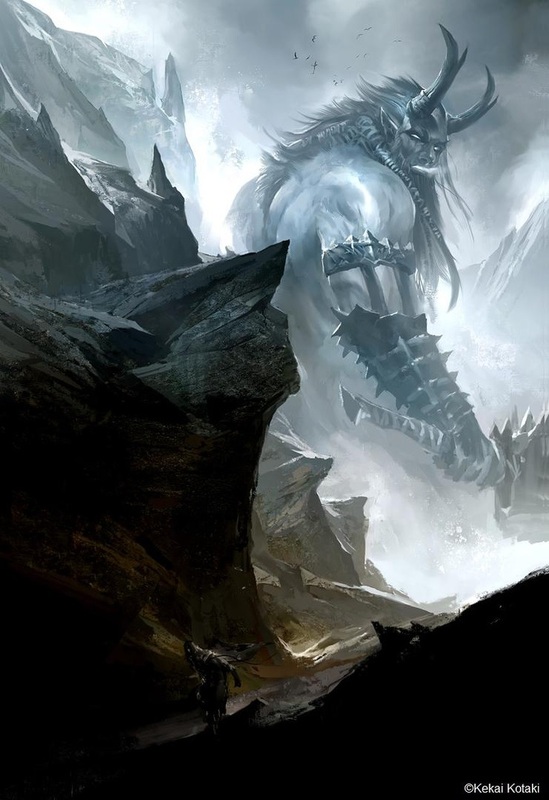 Along with this, the Cloud Giants also stripped them of their magicks that they were so famous for, so no longer could the Frost Giants bond with giant wolves or polar bears, nor could they lower the temperature till their enemies steel weapons cracked like stone or summon blizzards in the middle of summer. Additionally, many Frost Giants were put 'on Ice' in suspended animation, awaiting the time the Cloud Giants required their services once more. Cold Blast: The Giant can blast jets of cold air from its mouth. This does 1d6 cold damage in a 30' cone. All within the cone must save. On a failure they also take 1d6 Dex damage. Every round they spend within 30' of a Frost Giant or every time they are hit by a Cold Blast, they take an additional 1d6 Dex damage. If this Dex damage ever equals or exceeds your Dex score, you start shivering so badly you get -4 to attacks and any complex movements, and cannot perform any delicate action successfully until you get a chance to warm up. Damage Reduction: Frost Giants take -3 damage from all Weapons not designed to kill something as big as them. Your Sword is a toothpick to them. 1- An Evil Wizard has found a Frost Giant frozen in ice, currently in stasis. He wants to awaken the Giant and try and control it. If not stopped, there is a 2-in-6 chance he succeeds. If he does, he will have an obedient Frost Giant slave. If he does not, the Frost Giant will rise to continue the war against the Cloud Giants, for as far as it knows, that war is still ongoing. In actuality, the war has been over for almost five hundred years. 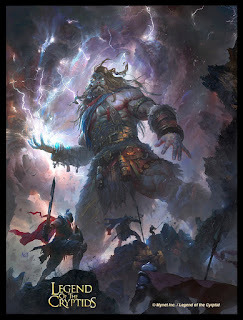 2- A Legendary Frost Giant thane by the name of Jormundar was once the greatest of his people. He was immortal by the blessing of the Storm King, immune to harm by any weapon forged by mortal hands. When he disappeared, his treasures were lost to history. Until now. Now his final resting place and his treasures has been found in an iceberg that is drifting down the coast. The race is one to claim Jormundar's legendary treasures, but when you get there, you will find that the warrior himself is not dead, but very much alive, merely in stasis. Anyone who disturbs his treasure will discover this first hand. 3- A clan of Demons has escaped, slipped through the gaps in the Celestial Net, and are besieging a city. However, just when things are at their bleakest, a small platoon of Frost Giants arrive. These Giants are here to fight the Demons and throw them back into hell, but they have no regard for the smallfolk inhabitants of the city. On the bright side, they will not stoop to looting the smallfolk homes either, so an entire city is up for grabs, presuming you are brave or insane enough to make the attempt and succeed without getting flattened between the Demons and the Giants. 4- A group of Frost Giants have arrived at a middling smallfolk city. They make their demands, they want food, iron, cloth and some other relatively simple items to acquire. They will leave peacefully if they retrieve those items. But the smallfolk in the city are bickering and haggling with the Giants, trying to get a better deal, while the various factions within it debate. However, the Frost Giants are losing patience. If their demands are not met soon, they will march into the city, burn it to the ground, and simply take what they need. Stone Giants are a strange caste. They are the caste of artists and performers, intended to write plays, make art, and attend to the Cloud Giants through commissioned work or to perform in the enormous carnivals of Giantkind. However, despite the ingenious nature of Giant technology and magic, it is not perfect, and much of it is degraded since the time of the Ascension of the Titans. As such, their is a problem that has afflicted the Stone Giants. A person can be taught artistic techniques, can be instructed in the techniques and history of artistic movements, and can be bankrolled, but if they do not have the initial seed of creativity, they will produce nothing but propaganda. There will be nothing transcendant about their art. As such, many Stone Giants find themselves unable to perform real creative work. This is also why Stone Giants handle complex work, such as maintenance of rare technology, carpentry, plumbing, architecture, glassmaking and other complicated tasks that Hill Giants are too dumb or clumsy to perform reliably. This whole state of affairs is relatively stable, but has lead to two informal sub-castes within the Stone Giants, the artists and the craftsmen. The craftsmen are the lowlier of the Stone Giants, with less prestige, even if the work they do is just as, if not more vital than the artists. They handle the skilled labor, they are the watch-makers and goldsmiths and woodcarvers. The artists are the far more regal of the Stone Giants, and here is where the most famous of their number come from. They write and perform plays, carve sculptures, paint paintings, write poetry and play instruments. But they also perform more specialized and unique services. For example, some Stone Giant Artists are trained in Fleshcrafting, where they take living creatures (and sometimes smallfolk) and modify them to resemble fantastic, otherworldly beasts. Many of the strange creatures that shouldn't exist but do are not created by Wizards, but are actually escapees from a Fleshcrafter's laboratory. It is also said this is where Beastmen came from. These two sub-castes are largely indistinguishable to non-Stone Giants, though these divisions often cause great scandal. For instance, if a Stone Giant that comes from a family of Artists has no creative talent, they are often shunned and disowned. Some manage to avoid this fate by stealing the work of other artists, or by bluffing their way through life. Other times a Stone Giant from a family of craftsmen discovers they have unique talents, and is catapulted to new heights of fame. This can often lead to resentment by more established Artists, who sometimes plot to destroy them. And this is the side of Stone Giants that almost no one knows about. Many of them, especially the Artists, are highly ruthless, and determined to climb to the top of their caste, by any means, legal or otherwise. 1- A Stone Giant wants to interview a famous person and maybe paint their portrait. This person is far too busy, powerful or hard to reach to respond to more civilized requests for a meeting. So instead, the Giant has hired you. Kidnap this person and bring them to me, alive and as undamaged as possible. 2- As above, except the person they want to interview is dead, and the Stone Giant is unaware of this fact. 3- A Stone Giant has been recruited by smallfolk royalty to create a work of art for some important occasion. However, in their haste, the royalty forgot, or more likely, didn't think to ask the Stone Giant if he was an artist or a craftsmen. As he is the latter, he is stalling for time, trying to come up with some mind-blowing work, before he is driven out of town or worse. 4- A horrible monster has suddenly appeared in our midst, and is attacking a small frontier community. The beast is horrific and unnatural, and must be killed. This horrific beast is dangerous, but it is also an escapee from a Stone Giant's laboratory, and is trying to communicate to everyone that it is not dangerous. The smallfolk who live in the community seem to disagree, and have their pitchforks and torches ready. Additionally, the Stone Giant is nearby, having tracked the escaped creature to this location. 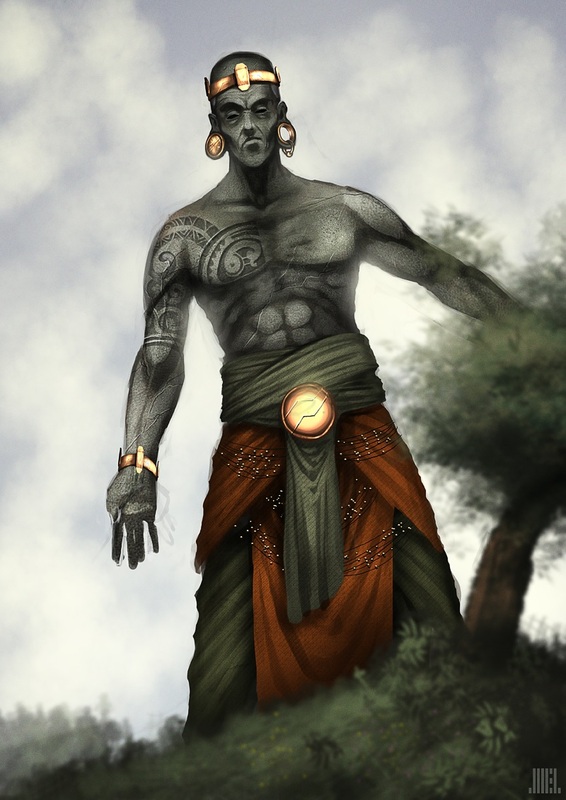 Sun Giants are often believed to be the rulers of Giantkind, but only by people who have never met one. But despite their impressive appearances, many Sun Giants are actually kooky, weird, or flat out insane. But usually, they are so involved in their thinking, they cannot relate to the normal world. They are the genius thinkers and philosophers of Giantkind, the stargazers and astrologers, the physicists and mathematicians. While other Giants focus on the practical nature of things, Sun Giants focus on the why. In greater Giant society, Sun Giants gather in laborotories or on street corners, to discuss the nature of reality with themselves and anyone who is unfortunate enough to be nearby. When not in Giant Society, Sun Giants live atop mountains or in distant locales, where their research will not be interrupted by smallfolk. Additionally, while many Giants have natural magicks that they can cast without cause of any mishap, they are not true Magic-Users. The Cloud Giants are skeptical of magic as well, for all the potential it has to cause madness and mutation, so this is a duty they have entrusted the Sun Giants. Sun Giants not only are the primary sources of magic in their society, but they also investigate the nature of magic and use it to create wonders and masterpieces for their Cloud Giant masters. Sun Giants have a 1-in-6 chance of being able to predict the future to a limited degree, and thus were expecting you. 1- A Sun Giant has created an amazing new spell, one that could change the world. News of this spell has reached the ear of a distant archmage, who has hired you to go steal it. He will be expecting you to double-cross him, and has already erected countermeasures in such case. Additionally, there may be others who are already in pursuit of the spell. 2- A Sun Giant has created an amazing new spell, one that is totally untested and highly dangerous. The Giant needs someone to test it out, as the Giant is crazy, but they aren't stupid. Would you like to use it? The spell, while useful, has some unforeseen side effect that only become visible later. 3- A Sun Giant has seen the future, and is randomly visiting smallfolk towns, babbling about alien stars and warriors galloping out of the sun. Track down the Giant and find out what he is talking about, before he is hurt or the prophecy comes true. 4- A Sun Giant and his assistants have kidnapped a Mathematician, a Wizard, a Poet and a Philosopher, and are holding them in captivity. The Sun Giant may not intend them any harm, but he refuses to let them leave. The uncontested rulers of Giantkind. Cloud Giants were originally meant to shepherd the other Giants, guiding and directing their impulses toward productive ends. However, the Cloud Giants have lost sight of this original purpose, and now either devote themselves to idle hedonism or fierce, internal competitions. The Clans of Cloud Giants engage in constant infighting, a constant battle of attrition meant to weed out the incompetent, overly malicious, or unproductive. These struggles are usually restricted to back-alleys and darkened rooms full of drug-infused smoke, but sometimes they spill over into greater Giant society and even sometimes into the lands of the smallfolk, drowning whole nations in warblood. For this reason, Cloud Giants are either total hedonists, willing to accept their lot at the bottom of the Cloud Giant caste, or are consumed with a lust for power and revenge, and are totally dedicated to ascending to the top-most point in all Giant Society, to become the ruler of all Giants and master of their homeland, the Sovereign, the one who sits upon the Throne of Clouds. All Cloud Giants, for various reasons, devote themselves fully to their tasks, and like other nobility, have no interest in actually pursuing useful work. There is no law against a Cloud Giant pursuing a common form of work, but anyone who displays anything more than a passing fancy in another field besides combat or politicking will be prevented from ever rising high. As such, Cloud Giants compete over land and workers. A Cloud Giant who has an ample supply of both will have enough income to support themselves and free them from commoner's work. But the most valuable thing a Cloud Giant can possess is not land or smallfolk, but other Giants. 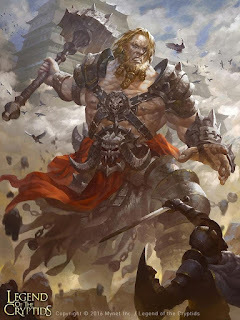 As the rulers, Cloud Giants are the only ones entitled to buy and sell other Giants, either from another Cloud Giant or by asking a lower caste Giant to sell themselves to the Cloud Giants. As such, while some Giants are free, able to pursue their own destinies and owning the product of their own labor, many more are owned by Cloud Giants. To a Giant, this is not a state of affairs to be discouraged. To them, slavery and being owned are the natural state of life and nature, and to be respected. Even cruel Cloud Giants can still be respected by their Giant slaves, and feared by any smallfolk they may happen to own. However, Giant slavery is not as cruel as the stories believe, and is more comparable to that of a Feudal Lord and his peasants. Most Giants regard the slavery the smallfolk practice as barbarous, a mockery of their noble institution. But merely accumulating wealth is not the aim of a Cloud Giant. To do so is another sign of having a low-caste mindset, something to be avoided at all cost by any social climbers. Instead, the Cloud Giants spend lavishly on themselves, their friends and even their subjects. Honored guests will be showered in gifts, Superiors can expect lavish "presents" (bribes) and rivals will be shown all the Giant's wonders, from their menagarie of rare beasts to their slaves to their vaults overflowing with treasure. Thus, even the lowliest of the Cloud Giants have beautiful mansions stuffed to the gills with magic items, treasure, rare monsters, and servants of various sizes. And this is barest standard of living acceptable to their kind. The greatest of the Cloud Giants live in unimaginable splendor; some even live up to their name, living in floating castles or atop clouds, where their smallfolk wear wings of wax and feathers in case they fall off a cloud, their Stone Giants carve elaborate sculptures of ice, and their Wood Giants herd the transparent, gelatinous wildlife of the Upper Air. These Cloud Giants are feared and respected by all, not just for their immense magical and martial ability, but for their ability to call down a legion of Giants to lay waste to a whole culture. Many a nation has offended a minor Giant, only to suffer the wrath of that Giant's unimaginable master. Also, one last note. There are no Storm Giants. Storm Giant is a title. The Cloud Giants who ascend to the highest tier, the Giants who make nations quake and armies melt away like snow before them are the only ones worthy of being promoted to the rank of Storm Giant. 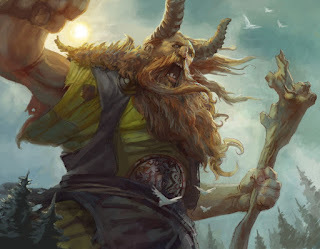 The Storm Giants are the greatest among the Cloud Giants, and from their ranks is chosen the Storm King, the greatest of their kind, ruler of all Giants and one of the among the strongest creatures in the universe. Cloud-Walker: Cloud Giants can walk on Clouds as if they were solid ground. They can also grant this ability to someone with a touch. 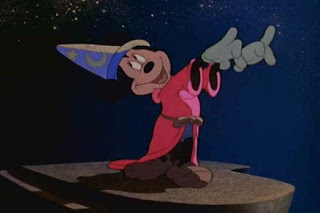 Innate Spellcasting: Cloud Giants can cast the following spells as a level 3 Wizard. Cloud Giants have a 2-in-6 chance of instead of being spellcasters, having the ability to turn into clouds as a full action. While a cloud, they can move and slip under doors, and are only affected by things that could hurt a cloud. Innate Spellcasting: Cloud Giants can cast the following spells as a level 6 Wizard. For even stronger Cloud Giants, give them class levels and abilities, plus 1 HD for each Class level they receive. 1- A wyvern is terrorizing a small barony. Hunt it down and kill it, please. However, once it is dead, you find out it was a favored pet of Cloud Giant Merchant. The Cloud Giant demands those who killed its pet handed over to him, alive. If the local ruler likes you, he may stall and allow you to escape. If he doesn't, he will try to ambush you and deliver you to the Cloud Giant in chains. 2- Two Cloud Giants are fighting a duel. Or so they claim. They've brought their entourages with them, merely as a precaution. Or so they claim. The local King is convinced this is a prelude to an invasion, and demands you investigate this so-called duel. What are the Cloud Giants actually here to do? Are they sincere, or is this the first move in a series? And regardless of what you are actually doing, be careful, as your interference or discovery could spark a diplomatic incident. 3- A slave market is having a special event, in which they will sell a massive prize, a living Giant! However, halfway through the auction, the event is crashed by a Cloud Giant and his entourage, who are here to liberate their brethren and steal everything that isn't nailed down as compensation. Anyone who gets in their way will be killed. And anyone who is good at exploiting chaos could make a fortune. 4- So it's War! Long ago, the Storm King made a treaty with smallfolk kingdom, ending a long, mostly pointless war. Since then, there have been no conflicts with the Giants and smallfolk. Until now. Something occurs rendering the treaty broken. However, while the smallfolk have long forgotten the War, the Giants have not, and they are coming. Bonus points if the PCs are the ones who break the treaty and cause the war.